Hello everyone, and welcome to Shovelware Adventure! This is a sprawling 100% vanilla compatible map originally designed for the Vinesauce mapping contest. It features a few heavily modified enemies, many areas inspired by the classics and should take the average Doomer about an hour to complete. Difficulty settings are thoroughly implemented here (as usual) to ensure anyone can have a fun, fair craic at this. The very end of the map is difficult even for me on UV, though I'm sure some of you out there with a sixth sense for Doom will have no trouble beating this! There are several different paths to the end. Speedy Doomers may find themselves in the final room in a matter of minutes, but you'll also be missing quite a few secret areas. It all depends which way you prefer to conquer this abandoned base. "What the hell is with that name?" I chose the name Shovelware Adventure because the idea from square one was to make a map that felt like a mini-episode all on it's own which simultaneously serves as a nostalgic reminder of those 'best of the bunch' maps you'd find on Shovelware discs - the little nuggets of gold in the middle of the poo! 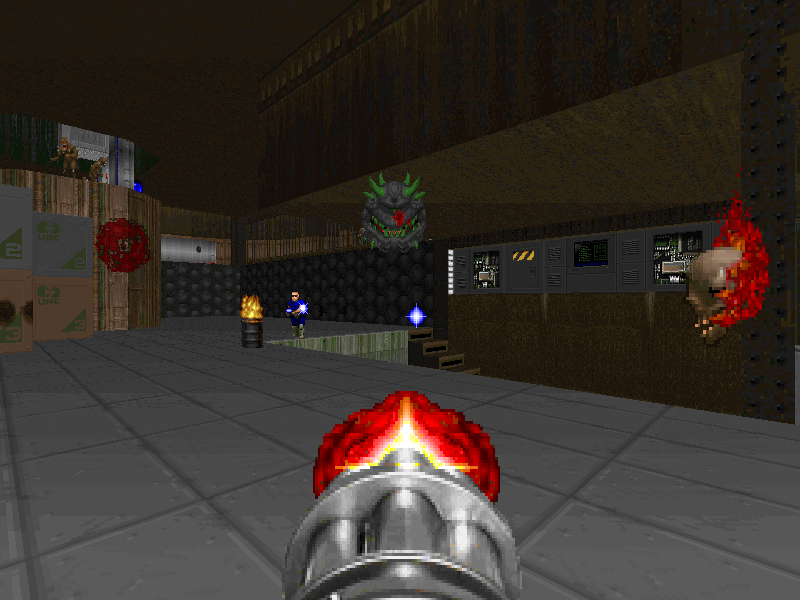 -Plasma Zombies are walking around the map sporting Duke's classic shades. They're dressed in blue so they stand out easily and attack like a slower Arachnotron. They are as weak as any undead enemy, but don't let two of these guys corner you - it takes only a few plasma balls to drain your HP. -RPG Zombies equipped with Revenant rockets are scattered throughout the map. Be careful, they look similar to Zombiemen, but are covered in blood and sometimes take 2 SSG shots to kill! -Cacodemons are now Toxicacodemons - Almost the same, but they now have a Baron's fireball which moves faster and stings much worse. -Cloaked Imps are found in many corners of the map - Basically the Imp version of a Spectre. -Psycho Imps, which are a shiny silver colour, are also scattered about. 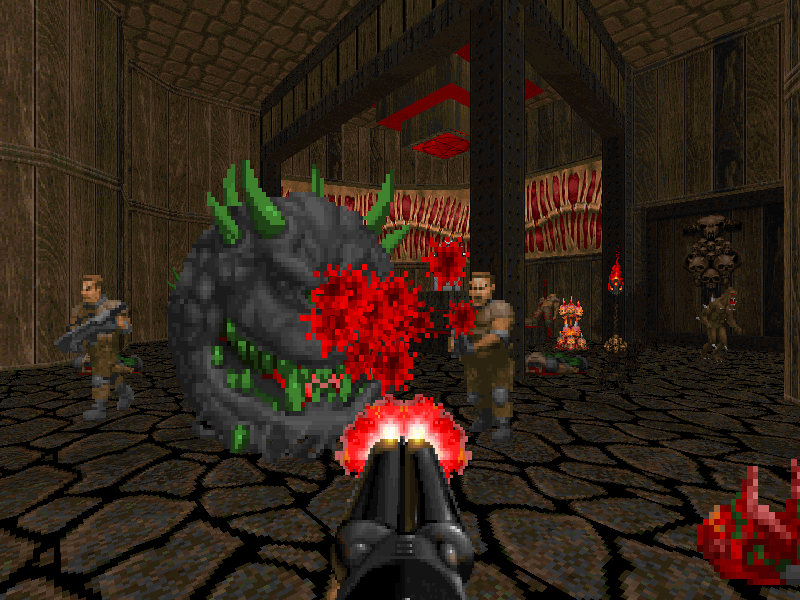 These are basically Imps on roids - Twice as fast, twice as strong, and shoot two faster fireballs. Their claws are also far more deadly. Don't let these guys near you! 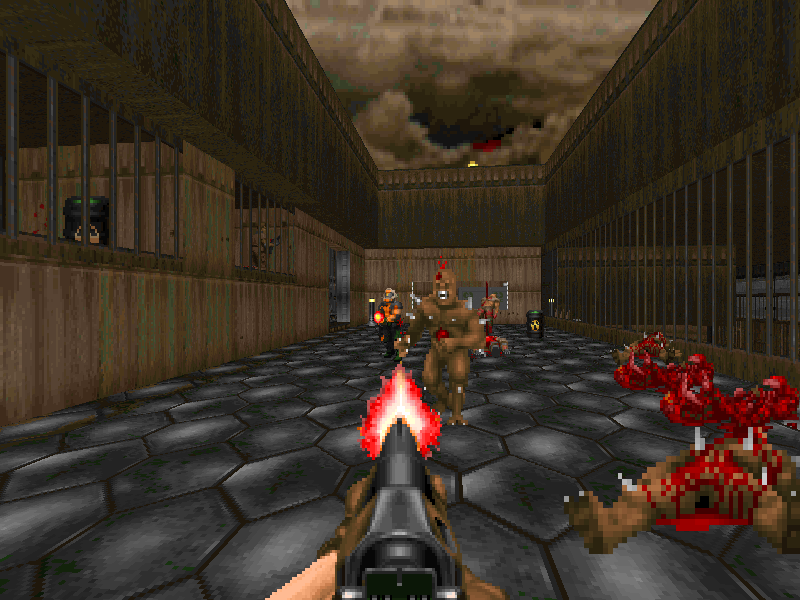 -It is absolutely necessary that you use the included shovelad.deh patch in Chocolate Doom, Boom and other ports if you choose to use them, however it is not necessary to load it in ZDoom, ZDaemon or Zandronum. I hope you all like what you see and have fun with this wad. I put a lot of effort in but am aware it isn't without flaw, so please leave feedback be it positive or negative, It all helps and makes for an interesting read! Seems a Great Work and WAD. We will run Shovelware Adventure on Friday’s Monster Mash. Forum thread here. Yeah, we played a bit FMM #206 - Shovelware Adventure. Great map with lots of modifications without loosing Doom spirit. Exit area is also a great idea! Thanks a lot for hosting/playing this guys, really glad you liked it Nice screenshots!